While Firefox and Chrome continue to gain market share over IE, Microsoft is getting closer to releasing their latest browser Internet Explorer 9 (IE9.) Although they are still a good distance off from their first beta, the test drive preview gives us a good idea of just how fast we can expect IE9 to be. Honestly, it’s a surprise that Microsoft hasn’t renamed the browser to something more original like Bing for instance. Regardless, IE9 is on its way. My first concern was the slower performance speed experienced using Google and Bing maps, but this puppy is fast. I was able to zoom in on the famous Seattle Space Needle in 2 seconds flat using the IE9 test drive and Bing maps preview. When will the first beta of IE9 ship? 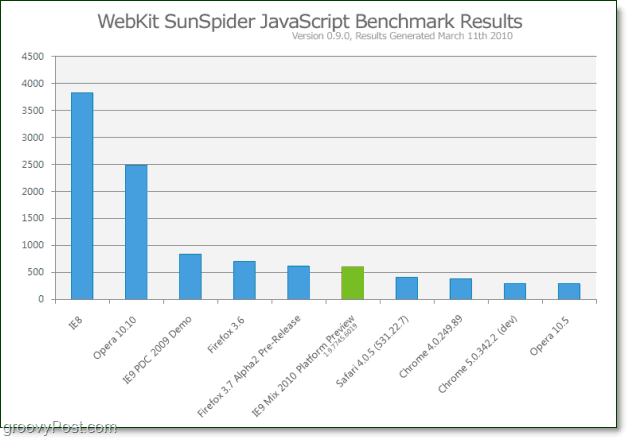 We will release beta of Internet Explorer 9 when feedback from the Platform Preview releases indicates we have a high-quality Web platform that can be used for everyday browsing of the Web. Check out the IE9 Platform Preview at http://ie.microsoft.com/testdrive/. After playing around with it be sure to post your comments/thoughts/feedback here! IE9??? Nice. Can you have it installed with IE8 at the same time? I’m going to guess that if you install this, IE8 will go bye bye. I’ve not tested that but… I’ve never seen 2 versions of IE on the same box. Cant imagine Mickysoft will change that with IE9. What is msseces.exe And msmpeng.exe?